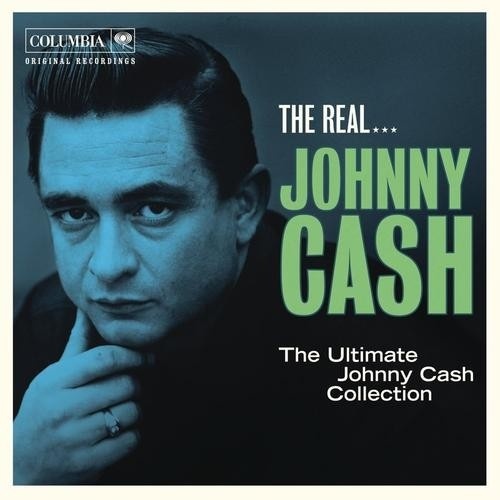 A collection of 30 fine tracks from the heyday of Johnny Cash's career, The Real...Johnny Cash: The Ultimate Johnny Cash Collection has an advantage over many Cash anthologies on the market in that it features classic early sides from Cash's tenure with Sun Records, as well as tracks from his longer association with Columbia Records. Curiously, though, many of Cash's biggest hits for Sun are featured here -- including "I Walk the Line," "Folsom Prison Blues," and "Home of the Blues" -- but the material from his Columbia years for the most part focuses on deep catalog and covers of traditional country and gospel classics. While these performances invariably capture Cash in excellent form, folks looking for numbers like "Ring of Fire," "Understand Your Man," "The Ballad of Ira Hayes," "A Boy Named Sue," or "Sunday Morning Coming Down" might wonder why they don't appear on the "Ultimate" Cash collection, especially since Columbia's current owners are the folks who put this set together. In spite of this, there's plenty of great music on this collection, and if you're in the market for a disc that offers some excellent and inspiring lesser-known recordings from Johnny Cash, this album is well worth investigating.